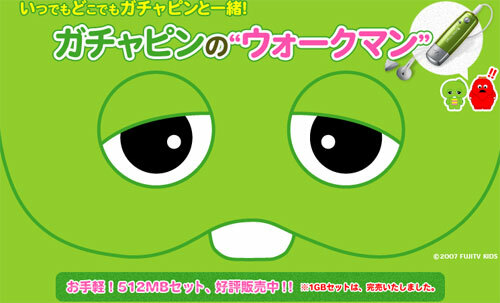 The ¥13,650 Gachapin Walkman is a standard NW-E002 Network Walkman with 512MB of memory onboard but it comes with a sheet of stickers of the cuddly baby dinosaur and his pals, a cover for the player, a cover for that cover and even a box to put both those covers and the Walkman in. Anyone after one of these strictly limited collectors pieces will need to move fast – Sony is offering just 300 of them and the 1GB model sold out long ago. Lastly, and you can choose to believe this or not, the Gachapin Walkman is aimed at adult women in their 20s and 30s – Japan’s like that.